This Exchange Mailbox Recovery Software has been rated 8.0 out of 10 by FinancesOnline. Users can use this application to recover deleted items from Exchange Server. It provides the best solution to repair Exchange Public Folder as well as Private Folder. 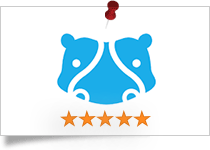 G2Crowd has given 5 star rating for its great performance. They have rated it as the best Exchange Mailbox Repair Tool due to its option to restore mailbox database from EDB File. The Exchange Mailbox Recovery Software has got 5 star rating by CNET for its efficient performance and great conversion ability. 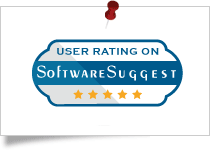 SoftwareSuggest has rated this application as the best Exchange Database Recovery Software for the users who want to recover permanently deleted mailbox from Exchange Server. This Exchange Mailbox Repair Tool has received 4 star rating by the Filehippo software due to its unique set of features and robust performance. The Exchange Database Recovery Software is designed in such a way that it helps repair Exchange Mailbox from both the dismounted & offline EDB files. In addition, it also makes easy to recover deleted Mailbox from Exchange Server. A user can repair and restore all data items like Emails, Contacts, Notes, Journals stored in EDB file of each mailbox. Another impressive feature of the Exchange Mailbox Recovery Tool is that it is capable to restore permanently deleted data from the Exchange EDB mailboxes. However, it also helps in recover all deleted data items from exchange mailbox such as emails, contacts, tasks, journals, etc. A user can preview all deleted data from Exchange Server and export it to Exchange Server directly. The Exchange Database Recovery Software provides users an option to export the recovered data in Live Exchange Server directly. One just needs to enter the required details and choose the version of Microsoft Exchange Server where all data needs to be exported. The exchange mailbox repair tool will export all data to that particular Exchange mailbox directly without any hassle. This is a best Exchange Database Recovery Software by which user can not only recover data from Exchange 2016 and below versions but also allows users to move data in it. If a user wants then, one can export recovered EDB file to Exchange Server for any other version also. In addition, the software is compatible with MS Exchange Server 2016, 2013, 2010 and all below version. A user can also use this Exchange 2016 Mailbox Recovery Software to repair and restore both Exchange priv.edb & Exchange pub.edb folders. Moreover, using this tool, it is really simple and easy to recover deleted Public Folder Exchange 2007 without any loss of data. This Exchange 2010 Mailbox Recovery tool also restore Exchange Private Folder. 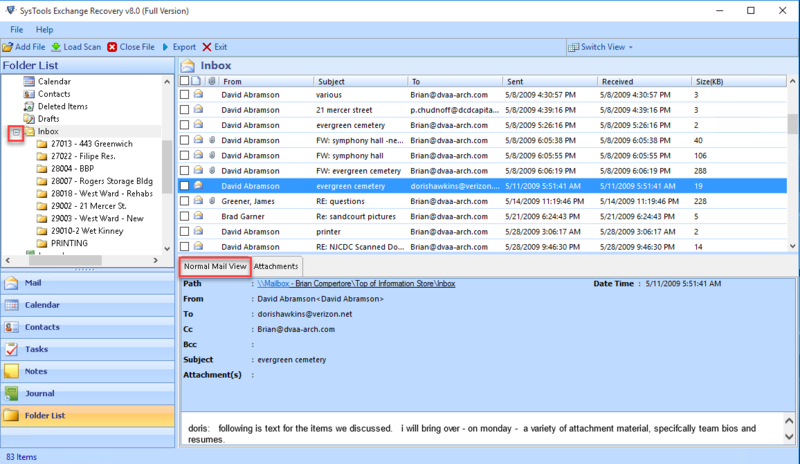 Apart from all this, the tool provides users an option to recover all deleted Email attachments in EDB file. While performing Exchange 2013 Mailbox Recovery, the software provides users an option to add EDB file. In addition, the STM file associated with the EDB file will be loaded automatically if available in the same folder. However, this Exchange Database Recovery Software will help in recovering both EDB & STM file at the same time. The application easily runs on any Windows OS like 10, 8, 7, etc. 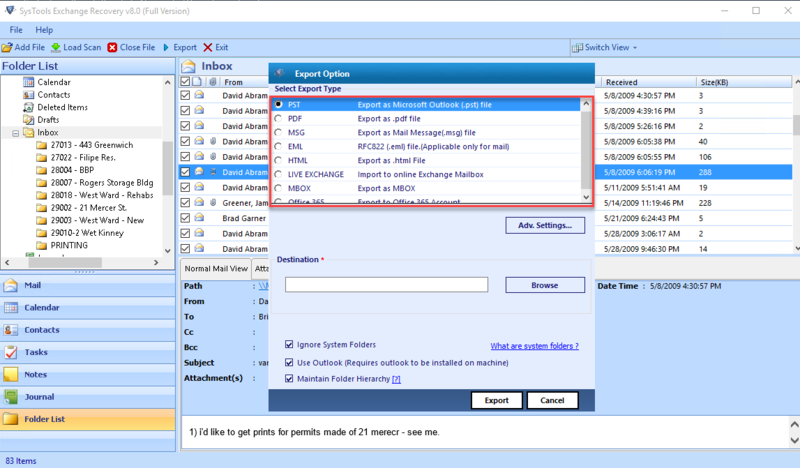 While performing Exchange 2016 Mailbox Recovery, the software provides users an option to export Microsoft Exchange database to MBOX, PST, EML, MSG file format. Therefore, a user can choose any of these file formats to save Emails and access it any of the supporting email application. In order to export recovered offline EDB files, the Exchange Database Recovery Tool provides multiple file types. Apart from EML, MSG, Outlook Data File, the software provides an option to export recovered Microsoft Exchange Database to HTML & PDF file format also. To Recover Exchange 2016 Mailbox Data, the tool offers two scanning modes based on the level of corruption. One is Quick Scan Mode, which is used whenever there is minimal corruption. However, Exchange Database is corrupted badly, an Advance scan mode is used. In addition, there is no EDB file size limitation in the tool. One can easily recover any size EDB file without any restriction. 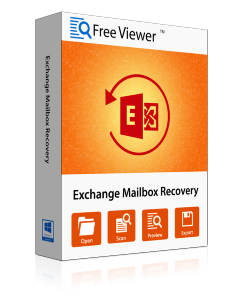 Another important features of this Exchange Mailbox Recovery Software is that it allows users to recover Exchange mailboxes even if Exchange Server is not active or down. Availability of the Exchange Server does not matter at all. However, if a user wants to export data directly to Live Exchange server 2016 & all below versions, Exchange Server environment is necessary. Demo Version of Exchange Database Recovery Tool Only Previews the Recovered Mailbox Items & Export upto 25 Items/Folder into Exchange Server/Office 365/EML/MSG/PST/PDF/HTML Formats. 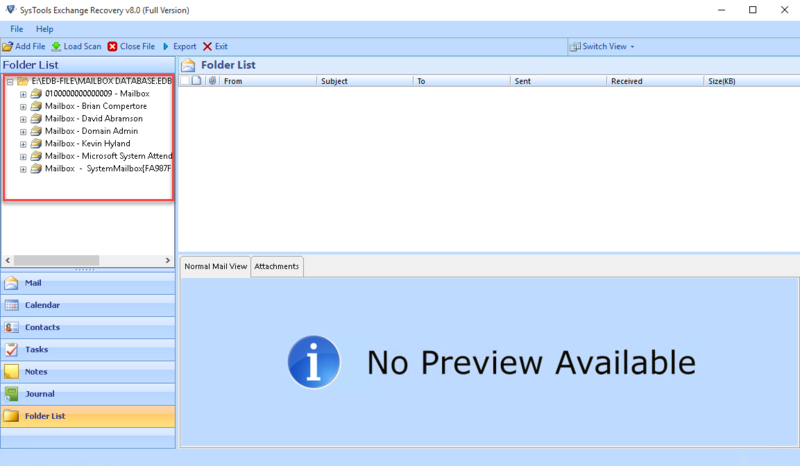 MS Outlook should be installed and configured for valid or dummy profile/account. For Windows 10/8.1/8/7 or Vista users, then launch the tool as "Run as Administrator". Explain the Working of Exchange Mailbox Recovery Tool? Step 1: Install & run Exchange Database Recovery Tool. 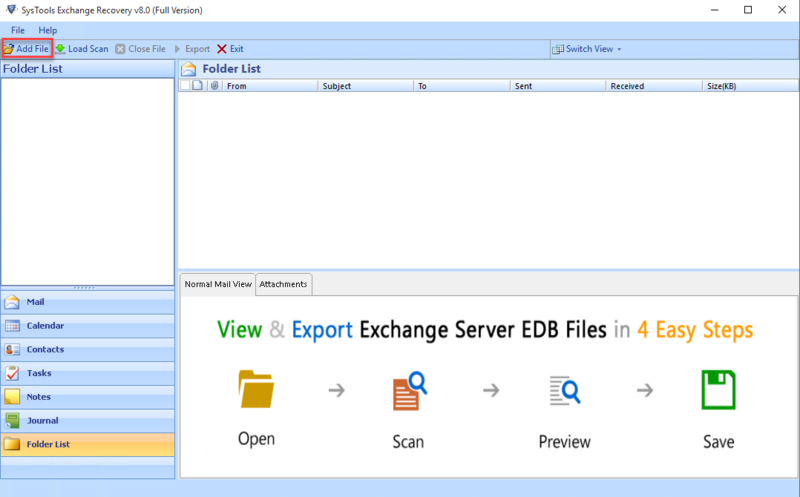 Step 2: Add & Load the Exchange EDB file. Choose the scanning option accordingly if your EDB file is corrupted. Step 3: After file recovery, you can view all the data items like emails, contacts, calendars, etc with the help of this tool. Step 4: Click on Export button to export EDB file to various file formats. Step 5: Select the file format and browse the location to save the output file. Step 6: After completing export process, the software will generate a status report to check success report of exported data items. Step 7: Navigate to the location where you have saved your file and then, you can access your data. Is it necessary to have a live Exchange Server environment to repair Exchange EDB file? Does the software provide me an option to move a mailbox from one Live Exchange Server to another via Exchange Mailbox Recovery software? No, the software does not provide an option to export mailbox from one Live Exchange Server to another. However, one can export raw EDB to live Exchange Server using this utility. Is it possible to recover both public folder & private folder of Exchange Server using this tool? Yes, with the help of this Exchange 2013 Mailbox Recovery Software, a user can easily recover both Public and Private Folders of Exchange Server without any issue. Can I Recover any size EDB file with the help of this Exchange Mailbox Database Recovery Software? Yes, the tool does not impose any file size limitation. A user can recover any size EDB file using this software. In addition, this application is successfully over a 1TB of the data file. Is it possible to export selective items from MS Exchange EDB files using this tool? Yes, the software provides users an option to check or uncheck data items that one wants to export before the beginning of the process. "I have never imagined a single tool with so many features. The Exchange Mailbox Recovery is one such utility. Apart from recovering Exchange Database EDB file, different option to export it is the best part that I liked about the tool. I liked this tool so much that I am definitely going to suggest this tool to my friends also. Hats off to the development team." "I was searching for the utility that provides me an option to export only selective data items from EDB file. After some time, one of the friends suggested me to use this Exchange Database Recovery software. I want to thanks the developers of this software for developing such a great utility. It was really a great experience while using this tool." "I have a bulk number of mailboxes of my colleagues in an EDB file. One day, the file got corrupt and I was unable to open it. Then one of my senior suggested me this tool. I found Exchange Mailbox Recovery software very useful. I recovered my data in plenty of time. I got positive results and I am satisfied with this utility!" "I have tried many tools for the purpose of converting corrupted Exchange Database mailboxes to Outlook PST format. After using this tool, I must say that Exchange Database Recovery tool is really worthy to buy. Its efficient working mesmerized me. Thanks a lot for this effective tool!"